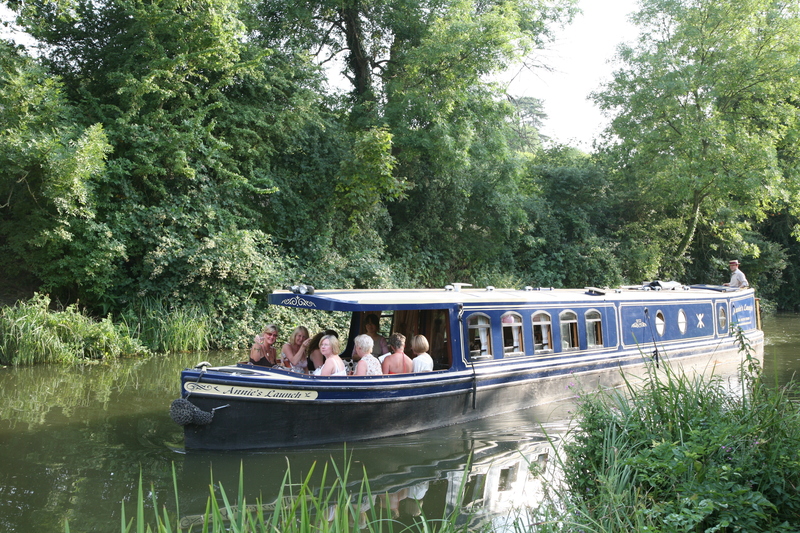 Cruise the River Stort in Hertfordshire. 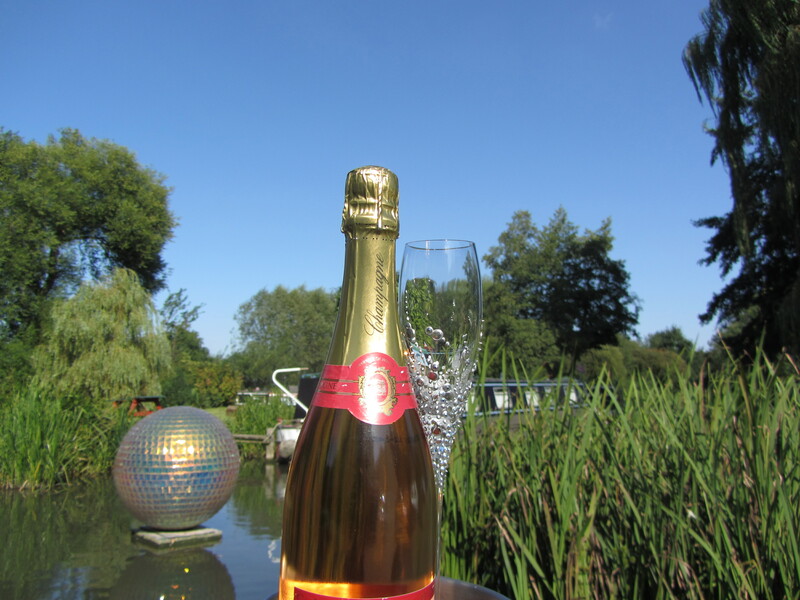 Annie’s Launch is a luxuriously appointed narrowboat restaurant, available with crew for private charter to cruise the picturesque river Stort. (Also available as self-catered boat hire with crew, and for mini yoga and meditation retreats). One of the prettiest stretches of navigation, the river Stort meanders through pleasant English countryside, along the Hertfordshire border. Everyday bustle seems miles away. The energetic might enjoy helping to work the locks, or simply sit back for a change, and watch this peaceful world slip by. 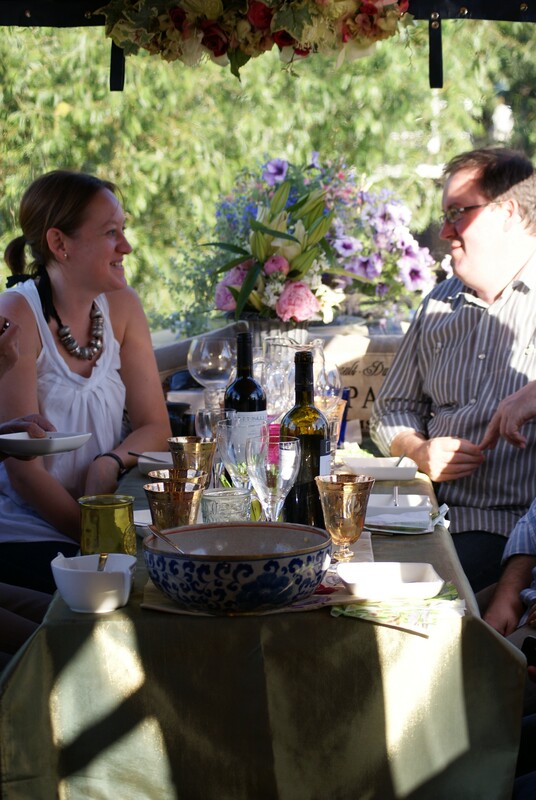 The well-appointed galley offers ample opportunity for Annie’s skills as a chef. Her speciality is Far Eastern cuisine, using subtle herbs and spices. Annie’s launch is moored at Parndon Mill, a centre for creative activity providing workspace for artists, craftsmen, and designers. On the ground floor there is a fine art gallery where exhibitions often spill out onto the island between the river Stort and the millstream. Traditional narrowboats are moored here, and in the surrounding fields are friendly farm animals that enjoy visitors. Tantalising! I look forward to experiencing Annie’s Launch! 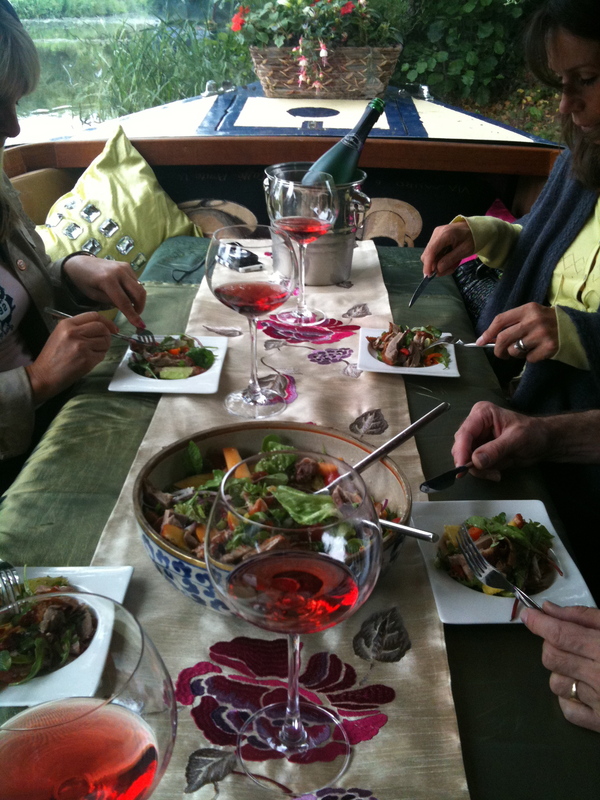 Annies Launch cruising restaurant customers enjoy a glass of wine before their entree during a cruise along the river Stort in Hertfordshire U.K. The front deck of Annie's Launch cruising restaurant set for a dining experience. 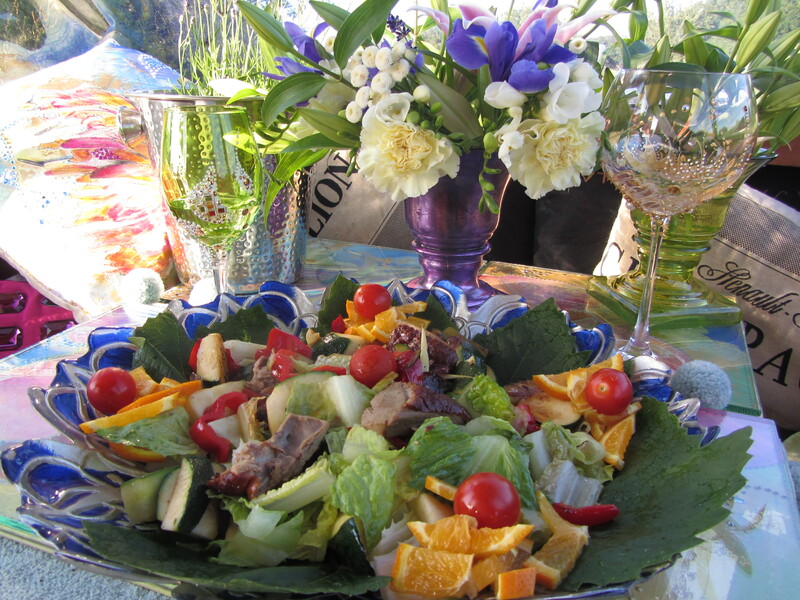 Aromatic duck salad tossed in truffle oil, served on vine leaves, in a decorative blue shallow glass bowl standing on hand painted serving mats. Complimented with flowers, and hand decorated glasses finished with 23 carat gold leaf. 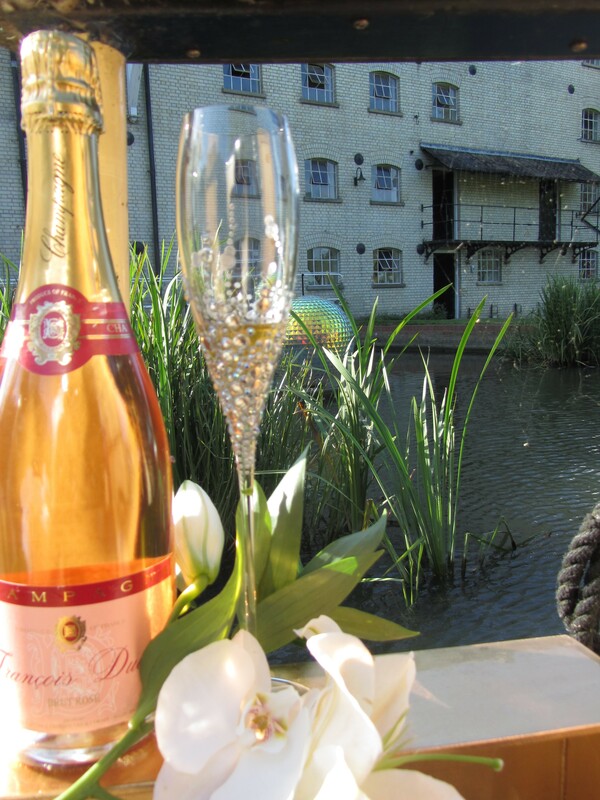 A sculpture in fibre glass by John Lewis provides the backdrop for a hand decorated champagne flute and bottle of champagne, on Annie's Launch floating and cruising restaurant, at the home mooring in Parndon Mill.